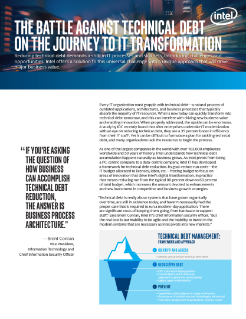 Every IT organization must grapple with technical debt—a natural process of outdated applications, architectures, and business processes that typically absorb the majority of IT resources. What is new today can quickly transform into technical debt tomorrow, and this can interfere with driving new business value and enabling innovation. When properly addressed, the upside can be enormous. Research shows that companies understand that a comprehensive IT strategy is helps them stay competitive and innovate.